The Bot Libre! 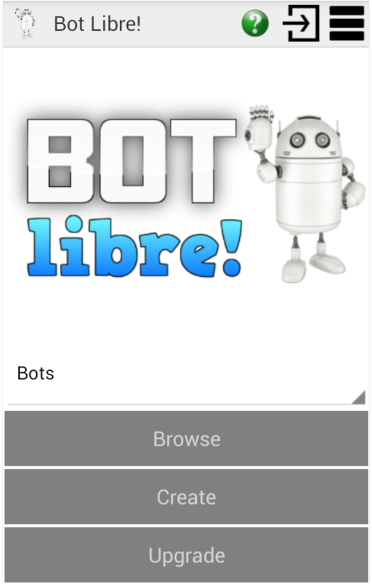 app can be downloaded from Google Play, here, or search for botlibre on Google Play from your Android phone or device. Sign In, or browse bots anonymously. Your sign in is remembered until you sign out, so you only need to sign in once. 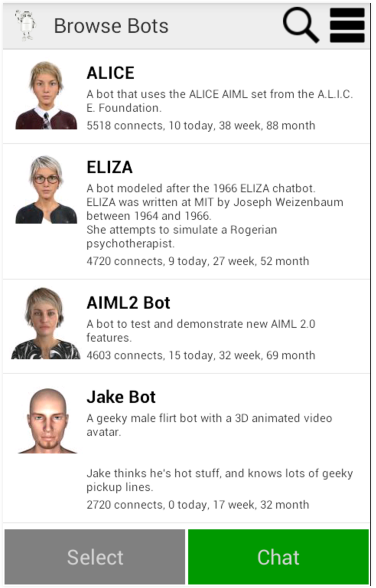 Browse public bots, or your own personal bots. Browse allows filtering and sorting of bots, and remembers the last bot you accessed. Chat with your bot with real voice and voice recognition, or through the keypad. Choose your bots avatar image, or upload an image from your phone's camera. You can also access any bot your create from the Android app from the web interface. The web interface allows additional administrative features for monitoring, and training your bot.